Set amongst towering palm trees and nestled against the beachfront along Durban's "Golden Mile", you will find 46,306m² of entertainment heaven - Suncoast Casino, Hotels & Entertainment. The complex is a haven of sun and fun with its Miami South Beach Art Deco style architecture, and offers an array of gaming, shopping, dining and Durban’s top live entertainment. Opened in November 2002, Suncoast Casino boasts 1,850 Slot machines and 71 gaming Tables, including the exclusive Salon Privé for higher limit Slots and Tables. With 21 restaurants and fast food outlets, kid's entertainment, 8 cinemas, The Barnyard Theatre, The Globe events venue, the Sundeck and the Boardwalk. 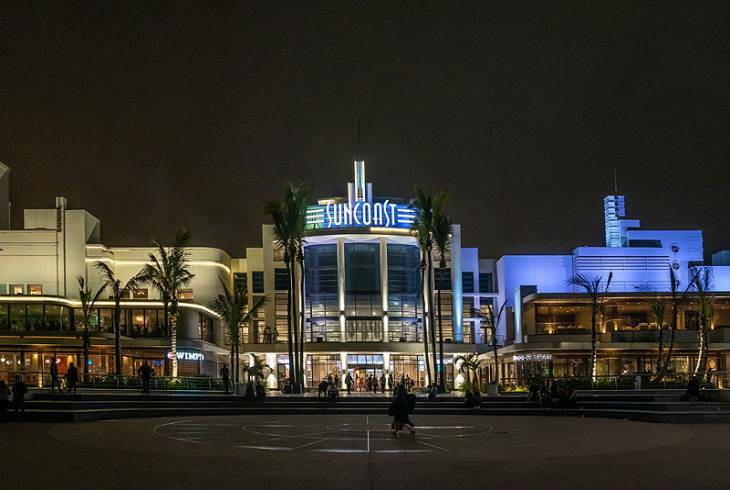 Suncoast offers something for everyone, and is a premier entertainment destination and a Durban attraction in its own right. The complex caters for the business-person as well, with a choice of places to stay including Suncoast Towers and SunSquare Suncoast. Along with the International Convention Centre and uShaka Marine World, Suncoast forms part of the Golden Triangle, and is a key element in the rejuvenation of the Golden Mile. Suncoast is one of South Africa's prime tourist destinations, voted Daily News Best Casino in KZN for 15 years in a row. Join us for an experience like no other and capture the unique spirit of Africa in beautiful Kwa-Zulu Natal. There is ample, safe parking at Suncoast. Pedestrians and cyclists enter for free, cars and motorcycles are R10. Taxis pay R 350. Suncoast is fully equipped for physically challenged patrons, with 13 open parking bays and 7 VIP bays, 2 toilets on the promenade and a toilet in the Smoking Casino, Main Casino and the Salon Privé as well as toilets located just outside of the Globe. There is also wheelchair access to the Main Casino, the Smoking Casino, the Food Court, restaurants and the Amphitheatre. Suncoast Casino, Hotels & Entertainment Information and Nearby Accommodation.